The Empire is a superior, located in the Upper West Side, a New York neighborhood with a tempo all its' own. This classy hotel is convenient for travel or leisure, and offers the warmth and elegance of European-style hotels, with state-of-the-art conveniences and amenities. With Central Park steps away and Lincoln Center right next door, the Empire is ideally suited for guests seeking a West Side experience only minutes from bustling Midtown and vibrant Times Square. The Empire's 375 rooms are well appointed with coordinating prints and classic furniture. The guest rooms are spacious, clean and well maintained to assure you of a trouble free visit. The rooms are comfortably furnished and face the city or the inner courtyard for a wonderful view from all of the rooms and most have a spectacular view of Broadway. The professionally trained staff is courteous, friendly and willing to assist you. 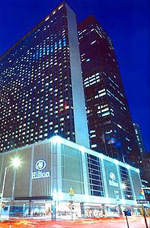 The Hilton New York is located at Rockefeller Center, surrounded by major media and business headquarters. It is one block from Fifth Avenue and two blocks from Madison Avenue. Many of America's largest corporations maintain offices in the skyscraper buildings around the hotel. There is easy access to three airports and three transportation terminals. LaGuardia is 18 miles. JFK is 25 miles. Newark is 13 miles. Grand Central station is 15 minutes cross-town. Penn Station is 15 minutes downtown, and Port Authority is 10 minutes downtown. Other attractions convenient to this hotel are: Museum of Modern Art, St. Patrick's cathedral, Times Square and Central Park. A hotel for the millennium - the Hilton New York just completed $90 million renovation and redesign. Spacious guest rooms offer stylishly modern decor featuring wall-to-wall windows with views of the city skyline. With over 2,000 guest rooms, Hilton New York is the largest hotel in New York City. All rooms offer the best in comfort and affordability The helpful multilingual staff is eager to make each visit special. A Broadway ticket office, sightseeing and transportation service desks are conveniently located in the hotel lobby. When you're hungry the hotel is ready to serve you at a choice of restaurants, lounges or room service. The Hilton New York offers onsite dining and is minutes to shopping and entertainment venues. The Pennsylvania Hotel provides guests with moderately priced rooms, including standard and renovated rooms. 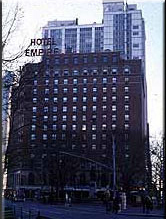 This grand hotel is located on 7th Avenue, spanning the entire block between 32nd and 33rd Streets. Situated in the Garment District of Midtown Manhattan, this hotel is across the street from Madison Square Garden, Penn Station and 4 blocks to The Jacob Javits Convention Center. Whether by foot, cab or subway, all of Manhattan is only minutes away from this hotel. 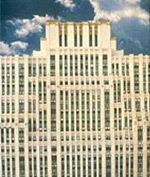 Originally built in the 1930's, a recent renovation included new elevators and an expansive lobby. Designed by the renowned firm of McKim, Mead and White, the Renaissance style hotel looks better than ever. The Pennsylvania's historic Cafe Rouge ballroom has played host to many of the Big Band Era's greats, including the Glenn Miller Orchestra. The Pennsylvania Hotel offers a choice of standard or renovated guest rooms. The accommodations are simple yet functional, providing your basic comforts whether traveling for leisure or business to NYC. 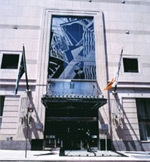 The Milford Plaza is located in the heart of the Theater District. Originally built in 1928, The Milford Plaza Hotel celebrates 20 years as New York's greatest hotel value. Billed as the Lullaby of Broadway, the hotel features a convenient location in the heart of midtown Manhattan. It is just around the corner from fourteen Broadway theaters and just a a short walk from Radio City Music Hall, Rockefeller Center, Fifth Avenue shopping, the Javits Convention Center and so much more! The hotel offers a spacious, duplex marble lobby with crystal chandeliers, comfortable, well-appointed accommodations and friendly, courteous service. Refurbished in 1998, the guest rooms are clean, comfortable, and well-appointed. The hotel features a fitness center, available at your leisure. The professionally trained staff are friendly, courteous and willing to assist you with all those very special needs that only seem to occur when we are traveling. Allow the Milford Plaza hotel staff to make your stay a memorable and enjoyable experience. The hotel is convenient to many fine dining, shopping, and entertainment venues. Two Double Beds at Triple/Quad rate are on Request and Subject to Availability. The Millennium Broadway is a beautiful four star Art Deco hotel located in New York City's renowned Theater District, right in the heart of Midtown Manhattan. Two blocks north of bustling Times Square and two blocks west of the glamorous 5th avenue shops, the Millennium Broadway is also only minutes to Bryant Park, Grand Central Station, and the Rockefeller Center. The unique design of this first class property allows the guest a myriad of choice and convenience---split into two sections and joined by the Hudson Theater in the middle, the Millennium shares its block with a sister hotel, the Premier, and boasts a world class restaurant, "Charlotte." Given consistent raves by New York's famous Zagat Guide, "Charlotte" is located in the hotel's elegant wood and marble lobby. Its menu features innovative New American cuisine, and it has proved very popular with both Manhattan natives and the Broadway theater crowd. Another distinguishing feature of the Millenium is its state-of- the-art meeting facility, the only hotel meeting center in New York officially approved by the International Association of Conference Centers. Each of the Millennium's 638 guest rooms and suites is luxuriously appointed, exuding the elegance and energy of The Big Apple. The rooms feature all modern conveniences suited to the 21st century traveler, and such extra special touches as oversized beds, merino wool blankets, and goose down pillows. Business guests will delight at the guest rooms' dual phone lines for simultaneous voice and data access, voicemail in four languages, and in-room safe. The hotel's friendly and efficient staff will cater to your every need, making your stay special and memorable. The Millennium Broadway hotel is only minutes to fine dining, shopping and entertainment venues. The Millennium Broadway hotel offers rollaway beds for $35.00, and need to be requested in advance. 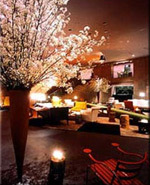 The Helmsley New York is located within 1 block of the United Nations, and only 2 blocks from Grand Central Terminal. The heart of Manhattan, Times Square, is just a ten minute stroll down 42nd Street. But location is not the only thing The Helmsley New York has going for it. The Helmsley attracts travelers from around the globe, and fellow New Yorkers alike, appealing to the most discriminating food critics anywhere. They come to mingle and dine at Mindy's, a magnificently designed tri-level gourmet restaurant, and at Harry's Bar, where the martinis are legendary. All of the "Big Apple" is a short stroll, cab ride, or subway token away from The Helmsley New York. The Helmsley New York has beautifully appointed guest accommodations that are the pinnacle of elegance and comfort; from the gold leaf embossed hardwood hangers to the signature bath beads. Attention to detail and the finer things are what you can expect at The Helmsley New York. All guest rooms have three phones, each with two lines. If you are a business traveler, you can rent cellular phones, PCs, and office equipment in the convenient Business Center. So please, allow the staff to make your visit a memorable and pleasurable experience. The hotel is just minutes to several fine dining, shopping and entertainment experiences. Located in Times Square, Paramount is a stylish, Art Nouveau hotel designed by Philippe Stark. The hotel was recently renovated in 1998. The hotel implies an unspoken rule that service is priority one. For your dining pleasure, the hotel boasts Mezzanine Restaurant, which is sure to exceed your dining expectations at every meal. Cocco Pazzo Restaurant provides the perfect setting for that quaint lunch or dinner. If a boost is what you need, try Dean & Deluca Gourmet Specialty Shop. The gourmet coffee shop provides takeout for guests on the go. Finally, in the quiet scene there is the library bar and the whiskey bar.The New Paramount Bar opens April 21st. The Paramount boasts well-furnished guest rooms that are comfortable and are adorned with the most modern, pop-nuevo style furnishings, with bold prints and striking wall art. The state-of-the-art fitness center is unparalleled; available upon request, the hotel offers a personal trainer, and in room massages service. The multilingual staff is eager to attend to your needs as they arise, with warm welcoming smiles. If indoor relaxation is more appealing to you, take advantage of the 24-hour room service and afternoon coffee and tea service. Paramount, the hotel that introduced the world to the notion of "Cheap Chic", is opening to the public its newest masterpiece May 7th. Taking inspiration directly from the energy of Broadway and Times Square, PARAMOUNT BAR is a stage set for casual glamour. The hotel is minutes to fine dining, shopping, and entertainment. The Edison Hotel is a lovely, first-class hotel located in the heart of New York's exciting, historic theater district, approximately 30-45 minutes from La Guardia and Kennedy International Airports. This delightful hotel, originally constructed in 1931 in the same grand, Art Deco style as the famed Radio City Music Hall, offers guests the very best in superb service and excellent accommodations at reasonable prices, making the Edison one of New York City's most popular hotels. Each spacious, comfortable guest room at the Edison Hotel is tastefully decorated in warm, rich colors with attractive, modern furniture, and all guest rooms are fully equipped to meet the needs of today's travelers. The Edison Hotel features several delightful restaurants,as well as a piano bar and lounge where guests can relax over a flavorful meal or a quiet drink at the end of each day's exciting adventures. Parking is available at $29 per day for passenger cars. Higher rates apply for trucks and SUVs. The hotel staff is always ready to meet the needs of every guest, and the Edison is just minutes to fine dining, shopping and entertainment venues. The Plaza Hotel is a New York legend, located at the most prestigious address of 5th Avenue and Central Park South. The very name of this establishment is synonymous with class---since it first opened its doors in 1907, the Plaza has upheld its impeccable reputation and remained the premier choice of the sophisticated, knowledgeable traveler. Constructed with all the pomp, glory, and opulence of a French chateau, the Plaza is exquisitely decorated, with remarkable elegance and beauty in each meticulous detail. Each of the Plaza's 805 rooms is luxuriously appointed and equipped with all the modern amenities today's discriminating traveler has come to expect. Extra special touches include original chandeliers, custom fretted beds and bath linens, and a breathtaking en-suite bath with fluffy heated towels. Business travelers will find at their disposition a host of well-equipped meeting rooms in varying capacities and configurations. The Plaza's four in-house restaurants cater to the different tastes and moods of their sophisticated clientele, and its top of the line security allows it to host its very own Art Gallery and such first-class boutiques as Roxanne Jewelers, Neuchatel Chocolates, Oscar Blandi Salon, Maurice, Bellisima, Napoleon Men's Shop, and the Plaza Spa. Guests will also love the convenience of an on-site barber shop, a florist, and a gift shop and newsstand featuring periodicals from all over the world. Make your next stay in New York a visit to remember by sharing the set of some of our most beloved classic movies: By Right Of Purchase, No Limit, Breakfast at Tiffany's, The Way We Were, North By Northwest, and Annie. Others who have called The Plaza NewYork include architect Frank Lloyd Wright and author F. Scott Fitzgerald, as well as numerous Kings, Presidents, Ambassadors, and stars of stage, screen and sports. Put yourself in a place where the pampering never stops, and the glitz and glamour of the Big Apple is always close at hand. The Plaza Hotel is a true NYC classic, only minutes to fine dining, shopping, and entertainment venues. 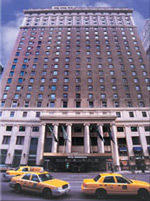 The Roosevelt Hotel is a landmark hotel located on the fashionable East Side of Midtown. Just four blocks from the Rockefeller Center and Radio City Music Hall, this hotel is within walking distance of Times Square and Museum of Modern Art. Within a mile of the hotel guests can visit the Empire State Building, Central Park, United Nations Building and Madison Square Garden. This is a full service hotel and a concierge is available to assist with any request that may arise during your stay. The hotel has a beautiful high-domed ceiling in the lobby, which is decorated in a period Art Deco style. Guests will find fine dining and cocktails on-premises at Teddy's Table and The Madison Club Lounge. The Roosevelt's luxurious guest rooms are comfortable and well appointed with modern amenities and classic furnishings. Guests will find that the Roosevelt provides first class service, a professional staff, and Fifth Avenue shopping around the corner. A new, well-equipped onsite fitness facility is open to guests 24-hours a day.The Roosvelt Hotel is a wonderful choice for all types of travelers! Book a stay March-June, 2004, and enjoy a variety of special features as the Roosevelt pays tribute to its 1920s origins. During March, the Madison Club Lounge will be transformed into the Roosevelt Speakeasy, featuring "moonshine" drinks for 1920s prices. April brings swing- dancing lessons in the ballroom, while Monday Movie Nights, hosted in May, will include silent classics from the 1920s, and "talkies" from the 1930s, along with complimentary popcorn and soda.